Enjoy an incredible, free family day out at South Bank Parklands this Australia Day. Celebrate Australia Day with a stunning cityscape, lush park setting, live music and fireworks on Saturday 26 January. All this, happening in the sprawling parklands of South Bank, offering ideal picnicking with friends and family as you dawn your green and gold for some good ole Aussie fun. Celebrate Australia Day with friends and family at O’Reilly’s Canungra Valley Vineyards! Cool off from the sizzling summer heat on their picturesque 15-acre property complete with historic homestead, lush vines, wine cellar and the bubbling Canungra Creek. Grab your friends and family and splash into Australia Day at the Gold Coast Aquatic Centre Pool Party! From the moment the centre opens at 6am, jump right into a day of fun – whether it’s the free outdoor Boot Camp at 8am or a free Aqua Aerobics class at 10am. Then, the main party will get underway from 11am with dive demonstrations, novelty races, inflatables and dive boards, BBQ, thong throwing and dive bomb competitions, music, entertainment and giveaways until 2pm. 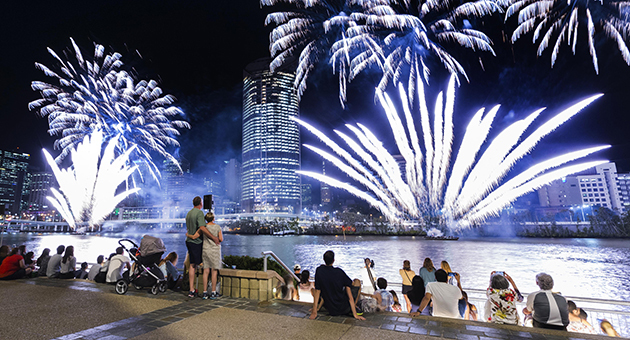 Kick off your Australia Day with a bang at South Bank’s River Quay. Promising soulful performances from talented local artists – Birdman Randy, the Ivory Street Preachers and special guest DJs, just to name a few – all afternoon, as well as great food and even better vibes right through until 5.30pm, as well as a dazzling firework display from 7.30pm (complete with pyrotechnic jet ski performers), this Australia Day at South Bank is not to be missed. Be part of the festivities at the Gold Coast’s 2019 Australia Day Celebrations! Headlined by Mason Rack Band, the winners of the Gold Coast Music Award’s 2018 Best Live Act, and supported by an impressive line-up of local talent, this free event – complete with delicious food vendors, an Aussie Activities Zone, beach volleyball and even a mini Commonwealth Games – concludes at 8pm with a spectacular firework display set to rival New Year’s Eve. Catch your favourite cat and his tall, red hat when he comes to Brisbane! Be taken along on an adventure with Sally and her brother, in a word-for-word stage adaptation of the classic kids’ book. If your child is a massive Dr Seuss fan – and let’s face it, who isn’t – this production is an unmissable opportunity to see one of his greatest, most distinctive works come to life before your very eyes. The Broadway musical phenomenon is coming to HOTA, in an all-new, high-energy production that will have you wearing leg warmers, leotards and headbands again! Relive the highs and lows of the students at New York City’s High School of Performing Arts as they pursue their dreams, challenge themselves and each other, and discover there is more to life as a successful performer than simply knowing the music and the steps. Keep the Australia Day celebrations going with the inaugural Graze on the Green! Links Hope Island will be transformed into an evening picnic space, perfect for families looking to enjoy delicious food, beer, wine and entertainment. Expect a selection of the best food trucks in town, the musical stylings of Shane Wilkinson and Gas Grooves and plenty of fun! The Lifeline Bookfest is back! Expect to discover over one million books across ten massive days, all the while raising vital funds for Lifeline. Book lovers will love browsing the 4.5 kilometres of tables holding up 22 semi-trailer-loads of books, but it’s not just books up for grabs at the Lifeline Bookfest Brisbane – you’ll also find comics, magazines, records, stationery, puzzles, DVDs, CDs, vinyl, board games, sheet music and more. Summer fun at Pacific Fair means Moet and Chandon while you shop, but there’s only one weekend left! Enjoy a King Prawn & Moreton Bay bug roll and a glass of Moët & Chandon Ice Rosé when you spend $250 or more in any store, but get in quick: the promotion is only valid for the first 100 customers each day. Adapted from the book by Andy Griffiths and Terry Denton, this play by Richard Tulloch will delight audiences with the story of Andy and Terry’s Treehouse – which has reached an amazing 91 Storeys! It’s fantastically dangerous, complete with a deserted desert island, a whirlpool, and a giant spider, but Andy, Terry and Jill have no idea they’re about to face their biggest challenge yet. Staged for the first time ever at QPAC, it’s a show the family won’t want to miss! C’mon kids, let’s roll. Back by popular demand, Pac Fair’s car park will transform into a skate park for kids ages 5+ to learn how to get started, perfect some tricks for the more experienced or, for the more creative kids, get crafty at design school as part of Skate Fest! Did we mention it’s FREE?! The world’s tallest and most extreme standalone inflatable waterslide has officially arrived at Broadwater Parklands. The world record-breaking waterslide is not for the faint of heart and is definitely a thrill ride. Choose the intensity of your wedgie – from the Little Wedgie right through to the Big Chucka. There’s never been a better reason to get a wedgie! Go bananas for the 60 spectacular monkey specimens that are in town! From the tiny mouse lemur to the gigantic gorilla, ‘Monkeys!’ is a unique chance to get up close and personal with our closest living relatives. Make tracks to the Workshops Rail Museum these summer school holidays! Whether you’re running away with the circus, exploring the underworld of the Roaring Twenties, or getting up close and personal with the real life steam trains, diesel locomotives and more, make a day of it with entry to the Museum and all exhibits included in your ticket. Every year we vow to never repeat certain behaviours, but before too long we find them or something similar returning. Join the team from Fabic in this free community talk – in partnership with the Gold Coast’s Active and Healthy program – as they discuss what’s going on when you set a resolution and how to bring lasting behaviour change. 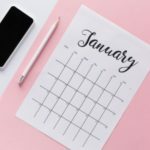 For all of the best family-friendly events going on this week and all month long in Brisbane, the Gold Coast and Byron Bay, check out what we’ve got on the calendar! Market mad? 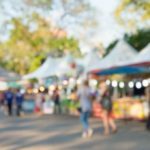 Check out our calendar for all of the coolest food, fashion and art markets on this month in Byron Bay, Brisbane and the Gold Coast! School’s out, and that doesn’t have to mean spending a fortune trying to keep the kids entertained. Check out our 50 favourite ideas for summer fun!